Tyger Tyger presents a new twist on YA fantasy: goblins. I've seen goblins mentioned in a few books, but this is the first book I've read that really goes in depth with goblin wars and Celtic mythology. The story is framed around the tale of Fionn Mac Cumhaill. Cumhaill fell in love with a beautiful, forbidden girl named Muirne. Muirne's father forbade their marriage, but they ran away together anyway. When her father leaned of the marriage, he made a covenant with Fear Doirich, the goblin god. The goblin god cursed the pair and sent goblins to chase them and their ancestors for eternity (how's that for a father?). Their child, Fionn Mac Cumhaill, was trained to be a fierce fighter of goblinkind. Goblins, in Hamilton's story, are evil creatures - something like dark fey. Teagan, our narrator and female protagonist is a normal teenage girl who loves volunteering at the zoo, hanging out with her kooky best friend Abby, doting on her brother Aiden, and studying hard/avoiding boys in pursuit of a college scholarship. Everything changes when Finn, an Irish, non-blood-related cousin arrives at her home. Finn is a descendant of Fionn Mac Cumhaill. Goblins chase after him, and he was born to fight them. Chaos breaks loose as Finn bring the goblins into Teagan's world. Her mom dies when she is attacked by a "shadow-man," and Teagan can suddenly see goblins. Cat-sidhe (pronounced cat-shee, I believe) are especially present: cat goblins that walk on two legs. When her dad disappears, Teagan, Aiden, and Finn have to set off into goblin-land to rescue him. There they face all sorts of adventures and Teagan learns that her world intersects with goblinkind more than she could have imagined. Teagan is a good character: likeable, realistic, brave without being too brave, determined although not lacking doubt. She isn't particularly unique. She could be replaced by most female protagonists of modern fantasy without much change in the plot. Similarly, her best friend Abby is a typical wacky, gullible, yet loyal friend. Nothing we haven't read before. These stereotypical characters aren't necessarily bad. Their qualities are over-used because the personality types work in so many different novels. And they work here. Teagan functions as a relateable girl. Finn is a good love interest. Brave, strong, smart, funny, charming, and loyal, yet haunted by his heritage. As an Irish traveler, Finn is constantly using Irish words and speaks like he's from a different century or world. It gets a little annoying after awhile. Teagan's 5-year-old brother Aiden is adorable and really holds his own in the story. He is brilliant, a human GPS, and a talented singer. I loved his fear of Elvis impersonators. I also loved Lucy, the little Sprite who becomes Aiden's pet when she weaves her way into his hair (literally). She is a brave and devoted little fairy. Tyger Tyger was an interesting story, but I didn't enjoy it as much as other readers. I thought it was hard to get into. The mythology was confusing and developed so slowly that I felt lost. The plot made leaps and jumps in time that just felt weird. I particularly thought the death of Teagan's mother came about too suddenly, and the pages just after her death felt disjointed - like the author had cut out an entire chapter. 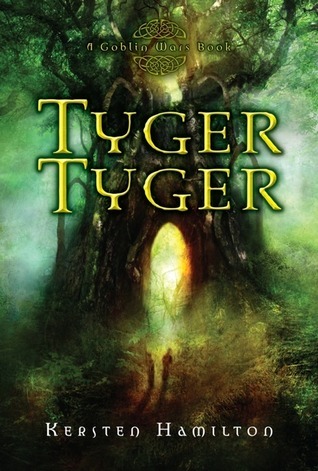 Tyger Tyger incorporates angels into the goblin mythology. For whatever reason, I really don't like fallen angel mythology. So that negatively affected my view of the story. As I said before, I thought Teagan was a fairly cardboard character. However, I did like her growth as she deals with the little plot surprises as the story develops. My feelings for Finn vacillated between like, love, and irritation. I just didn't believe him a lot of the time. Maybe it's because I can't envision real teenagers littering their speech with little Irish phrases like "boyo." While the mythology of Tyger Tyger is complex, interesting, and largely new to me, the plot seems like something that has been done before in a dozen different iterations. As with my comments about stereotypical characters, that's not necessarily a bad thing. Girl meets boy, family member is in great peril, girl and boy must go rescue said family member, girl and boy fall in love is an interesting story the first and the hundredth time. This time, though, it just didn't capture my attention. I would still recommend reading the book, because it is interesting and most people love it. In fact, I'll probably keep reading the series because I want to know what's going to happen to Teagan, Finn, and Aiden. It's just that Tyger Tyger was a "like" for me and not a "love." *Disclaimer: I received this book free via NetGalley. Thanks for the review! I've seen mixed reviews on this one--but I find the mythology part interesting, so I'd probably pick it up if I saw it in the library. Yes, Alison, my thoughts exactly! Disjointed with major plot holes. I just couldn't get into this book like other readers had. So many things about it just didn't work for me. It's interesting to use goblins. I might check this out anyway. I gave this book a 2 out of 5. I didn't enjoy the plot, or the characters. I felt like I was being thrown around a lot. I like the beginning, but after that "major event" happens everything goes a bit... meh. I liked the mythology though. Finn wasn't as great a I thought he would be. I know what you mean, I've had a lotta reads lately which are truly just likes and not LOVES. I'm just a tough customer to please. However, I have heard of others not totally enjoying this book, so don't feel badly. This book sounds so interesting and yet your review is definitely not the only one I've that has mentioned the plot is hard to get into. I may pass on this one. The reviews of this book seem to be about 50-50. I've got it sitting on my Kindle waiting for me. I'm going to read it, but I'm not sure it's ready for the "top of the pile" yet. Thanks for the honest review (really thorough, too)!! I think I might give this one a try and see if I like it since the reviews I've read have been so mixed. Yours has probably been the most balanced. I think I'll be reading this one soon, but I've also heard mixed reviews. I'll be reading it with both the good and bad criticisms in mind... I think I'm mostly interested because of the goblin theme, to be honest! But it is quite bizarre that there's angel mythology in with the goblins... whaaat?! LOL. Really nice honest review Alison, I enjoyed Teagan and her brother Aiden quite a bit, but I agree with the mythology being confusing. There were times where I just didn't understand all the different fairy/goblin groups and their loyalties which made things difficult now and then. Thank you for your review. The writing style of this one kept me from connecting with the story. I gave up after about forty pages. I'm sorry to hear you didn't like it much either. This is a really great, thorough review! I had considered reading this book, but now I think I'll pass. It's too bad. There really aren't very many YA books having to do with goblins. Thanks for such an honest review!